Leader of the neuromorphic platform Karlheinz Meier (Heidelberg University) says the majority of current platform users are computer scientists and physicists, with most of these PhD students and post-docs working on their research projects. “It is essential to understand that these machines are not conventional computers. Users are exploring new territory in a novel approach to computing. So many first time users are making themselves familiar with this unique facility. There is no other place in the world where researchers can remotely access neuromorphic computing systems without in-depth knowledge of hardware details. We are on our way to make neuromorphic computing a commodity” says Meier. 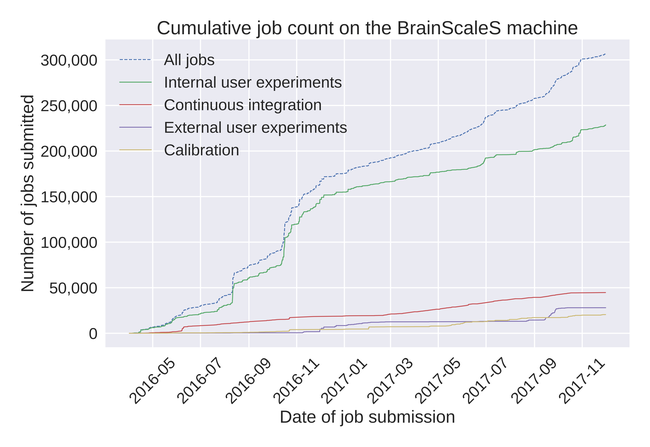 Figure 1: Number of jobs submitted to the generation 1 BrainScaleS machine. Whereas the design concepts of the machines in use date back to 2005, the second-generation prototypes for both the BrainScaleS and the SpiNNaker machines have been developed in a co-design process in the HBP. They implement recent findings of neuroscience, in particular concepts of learning and plasticity. By April 2018 the first new, single second generation chips will be in operation for both systems while the full scale large scale machines will be running by 2023. Figure 2: Number of jobs submitted to the generation 1 SpiNNaker machine. “What is really special about HBP is the co-design with neuroscientists, particularly the theoretical neuroscientists. And the next generation machines incorporate much more from these HBP neuroscientists, who among the top groups in their fields,” says Meier. He says for the second-generation BrainScaleS machine a major change is they have implemented the spatial structure of the “neurons” to include active dendrites. 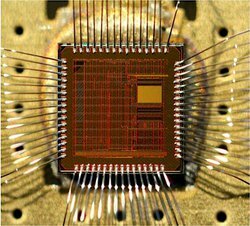 These second generation chips also have internal plasticity processing - a microprocessor on the neuromorphic chip whose role is devoted to controlling learning and plasticity. Both new features should eventually allow configuring continuously learning cognitive systems, a major step towards more biologically realistic artificial I.
Prototype of the second generation BrainScaleS chip.